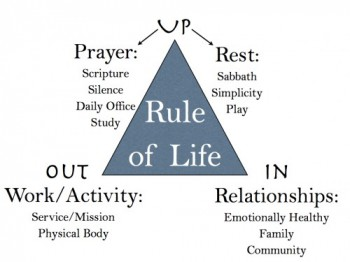 In anticipation of the Lenten season in 2017 we worked on building a Rule of Life, either for us as individuals or as a family. If you didn’t attend the class, here’s a quick crash course. A Rule of Life is a way of intentionally considering and ordering our lives, especially towards God. It is meant to function as scaffolding to our lives to help us prioritize what is important and not just what is urgent, with a mind towards spiritual growth and movement towards God. It is both descriptive and prescriptive; meant to describe our lives as they are and put order to what already is, but it is also meant to prescribe new practices so that we grow. 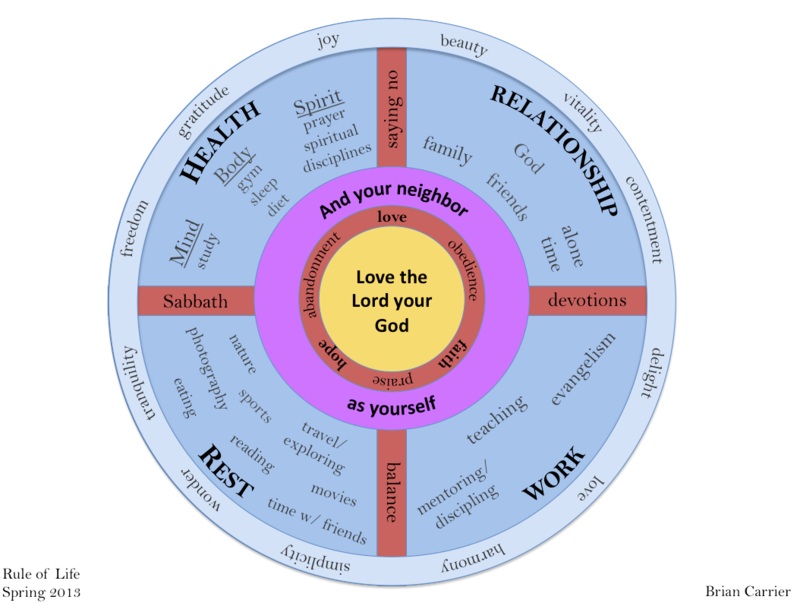 A Rule can be written for a community, like the Rule of Benedict, or can be written for an individual based on your days, weeks, months, and years. A Rule of Life can take on many forms: as a chart, a few paragraphs, a pictorial rendition of your time, etc. It is also a living document that will change as your lives change and the roles you inhabit change. Whatever it ends up being, it needs to be built out of reflection on who you are, who you want to be, what you value, and how you currently spend your time. Lastly, your Rule of Life should ultimately help you translate your values into action. Use the prompts below to do the reflecting work before attempting to set your Rule. Here are resources and then a few examples of different formats of rules. Think of four people you admire and answer why for each person. Write this down. What connects between them? What disconnects? Where are there similarities and where are there differences? How do you know when an activity or time moves you closer to God? How do you know when you move away from God? What are the markers of when you are in a good state? And what activities or structures are in play when you are fully alive? Name activities that bring you to life. Carve out space this week to sit and listen. Consider what is important rather than what is urgent. What kind of person are you called to be? What kind of person do you want to be? What are three of the most meaningful compliments you have ever received? What is one thing that will make you weep if you can’t do it or be it? 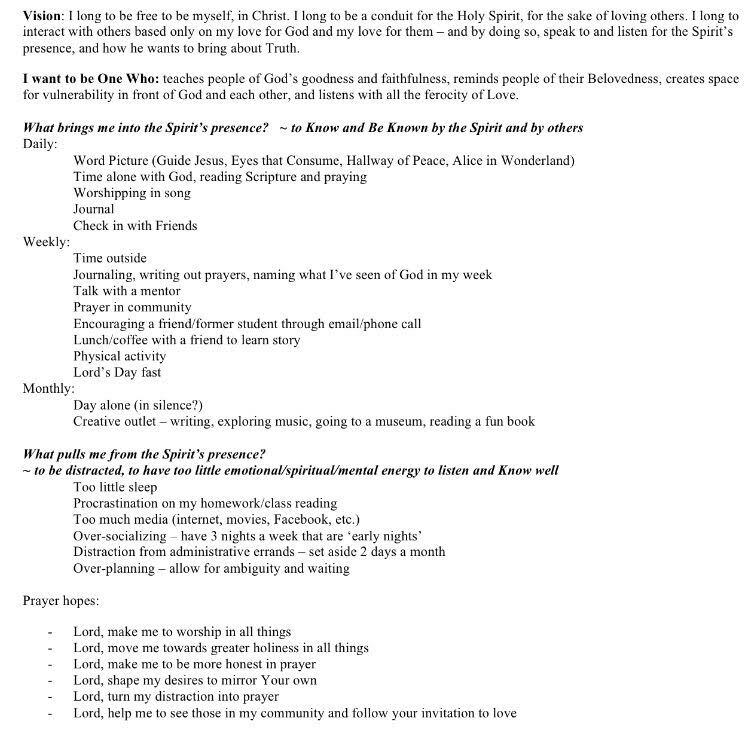 Try out the Compass Journaling Exercise from the Spiritual Gifts class. Consider and write down the pattern for what is typically a few days in your life. Where is most of your time spent? Based on your answers, what do you perceive your values to be? Consider the prompts from last week’s in-class work, then write down 5-10 words or phrases that identify your desired values (not necessarily those values you perceived above). 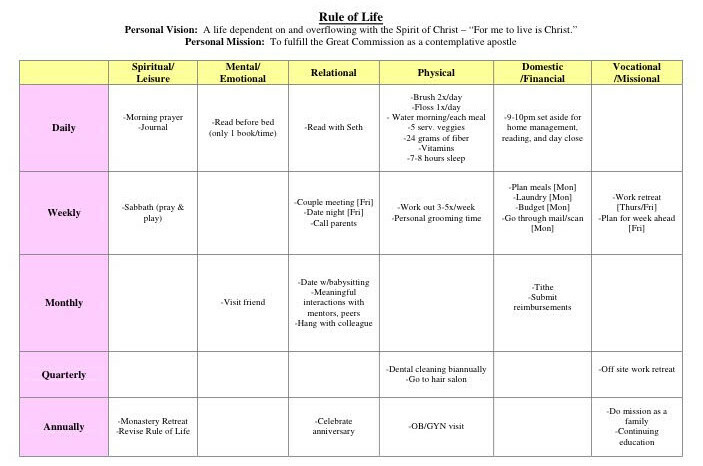 When determining these values, consider your roles, gifts, passions, and long term vision. Next, list those values according to their priority. Which of my behaviors align with those core values above? Which of my behaviors/actions conflict with those core values above?